Cozy Chicks: Recipe Hoarding--Are You Guilty? The struggle in this rent house kitchen focuses a lot around the lack of a reliable stove (burners either do not work or have only two true settings--hot or too hot) and there is no prep space. But the frustration I felt this week focused on my inability to find one of my favorite recipes. 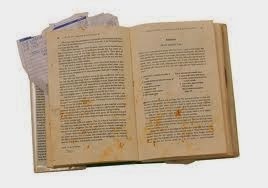 I have many many cookbooks which are all packed and inaccessible and though I tried to find this particular recipe online, I never found it. I had to improvise and it was an acceptable result, but just not the same. That inaccessibility to my recipes has made me realize I am a cookbook hoarder. In the past I called myself a "collector" but I now understand it goes beyond that. And I don't believe I am alone. new. 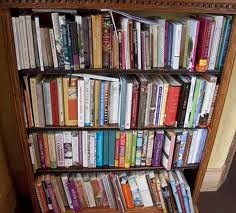 I could spend hours thumbing through cookbooks and though pictures are nice, I don't need them. That's the sign of a true hoarder. Pictures not necessary. cookbooks that are sold at the grocery store checkout counter and in my hunt for a specific one of those little books, I bought a whole collection on eBay. It was a gold mine and I did get the one I wanted. It had a special cookie recipe in it that I have made for years and love. I lost the book (or it fell apart) and though I was able to write into the local newspaper that had a "Recipe Quest" column weekly and got the recipe, I still wanted that book. Hoarder. Yup. a sister tradition! Low and behold one year, I was hunting and found a pristine edition of a cookbook that I had owned that had completely fallen apart. It was one that had been produced on a three ring binder. Someone had given it to me as a shower gift in the 1970's. You'd have thought I'd just won the lottery. Hoarder? Oh yes. What about you? What do you "collect" that stretches beyond rational? Is it cookbooks? Or something else? We collect books and science fiction artists works.Try to stop, but thenthere is another book that just calls to you. Without readers,writers would be basically writtingfor themselves. I collect books, yes, okay, hoard them. I think at the moment, I buy 10 new/secondhand books for every book I read or re-read. Yes, I am getting trouble with my bookspaces. And I collect figurines by Nene Thomas. They are so beautiful, but not cheap. I had to cull so many books when we moved and my husband wanted to THROW THEM AWAY! There are too many places that need books and I sure found homes for all of them. What was he thinking?? Some people just can't understand our love for books. Like my parents. There is a secondhand book stall at my local market place, that sells books for one or two euro's. I do give them some of my old or double books sometimes, and don't get much for them, but they will find a home again that way. I am always happy to find new books for myself too. Of course, I always forget to bring my booklist with me, so I keep buying double ones, which I give to my friends or bring back the next time. But well, how can I take the risk of leaving one behind for just one euro? Books! I have a cookbook collection that goes back to my first cookbook when I took a cooking class at Douglass College in 1973 (eek!). But I also collect regular books - hardcovers, paperbacks and now ebooks. Occasionally I go through the "live" books and donate to charity those that I can bear to part with. But that still leaves me with plenty. Guilty! I love cookbooks. I had a lot of them and when I downsized, I gave my friends some and my daughter in law some. I kept about 20 plus some from clubs and Churches. They fill a small bookcase in my kitchen. Now I don't buy cookbooks but I subscribe to a lot of the Recipe newsletters on the internet. I must print at least 1 or 2 a day. 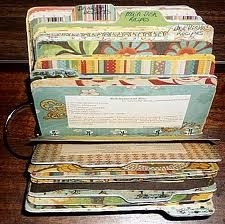 I then put them in a big pile or in a binder. I don't make most of these recipes,, I just want them...What is wrong with me? I'm only one person living here and can't eat all that food. Some things don't cut down too well so I will never make them for myself. You got me! I have been in the closet about this (as are the two boxes of recipes, files, booklets etc. That's not counting the shelves on the bookcases. I have quite a few of my mother's recipes, booklets and clippings too. I love this addiction though and don't plan to give it up anytime soon. My grandmother collected cookbooks. In fact, the picture of the bookshelf in your post looks a lot like ONE of the SEVERAL bookshelves she had that contained nothing but cookbooks. As she passed last December, my mom has been shipping the "good" ones to me, since Grandma's love of cooking and baking has been passed down to Mom and now to me. I have boxes of cookbooks in my living room now, along with a several inches high stack of recipes that Grandma and her mother (who we lost in 1998) cut out from various magazines and newspapers. 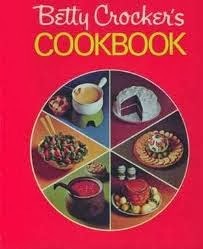 LOL -- that was the very first cookbook I got as a Christmas present from my mother. I still use it. It's held together by strapping tape. I have the same version at the cottage, too.